….so sorry we have been SOLD OUT for this workshop since mid January….but please look out for our next overseas workshop! Forage in the park grounds for blooms from the chateau’s own organic flower farm. Create a bouquet inspired by fragrances made by niche French parfumiers. Paint a watercolour of an arrangement in your chosen vessel. Construct wild and opulent urn arrangements in the Grand Salon and a botanical installation the 18th century chateau walls. Linger over a long lunch. Relax by the pool. Wander in the estate gardens. Explore the surrounding villages and visit an Abbey garden. in this elegant 18th century pink brick chateau 35kms south of Toulouse. It is situated in a small village surrounded by rolling hills-in the countryside between the Pyrenees and the Mediterranean Sea.The chateau is set in 5000 acres of parkland dotted with hundred year old trees- so lots of natural beauty to wander about in- or just admire it while we lie by the pool eating pate and sipping wine! On each one of four of the days of our stay we will have a workshop inspired by one of the senses: smell, sight, touch and taste are the inspiration for the four workshops below- and hearing will permeate them all as we listen to music while we create- and hopefully hear some local live bands at the restaurant in the chateau! We will talk about the French Impressionists like Monet- and their love of flowers as a subject for their paintings. From gathered from the garden blooms we will each create an arrangement in a chosen vessel. Then we will have a lesson in watercolour painting- and try to capture our arrangements visually and in 2 dimensions on paper! 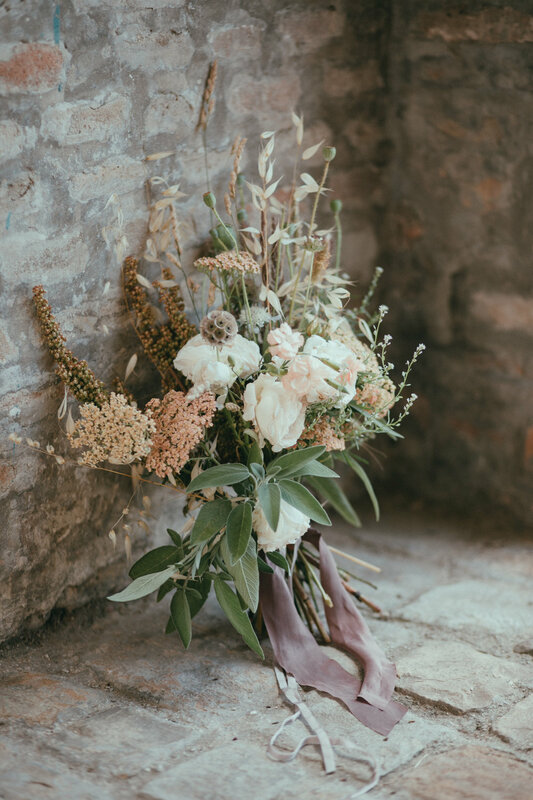 These workshops are suitable for all skill levels- from those who have merely dabbled at arranging flowers at home to professional botanical stylists….. you just need to love flowers! CARCASSONE: a hilltop town in southern France’s Languedoc area. It is famous for its medieval citadel, La Cité, which has watchtowers and double-walled fortifications. CAMON: nicknamed "Little Carcassonne", this fortified village nestles around an ancient Benedictine abbey and is one of the “Plus Belle Villages de France”. It is also known as the “village of 100 rose bushes”- their rose festival is at the end of May- so fingers crossed the stone houses will still be covered with climbing roses when we visit in early June! Then in the evening you may decide to try out some of the restaurants in the local villages and towns- or to eat in the restaurant called L’Auberge that opens from Thursdays to Saturdays in one wing of our own chateau- how lucky are we?! A deposit of $1500 is due now to secure your place. A second payment of $2000 is due 1st February 2019 . The final balance of $1400 is due 1st May 2019. Please note: places are NOT refundable after the end of January. If you are unfortunately unable to attend, you can arrange for your place to be transferred to another person- and please let Wildflower know. NOTE: There is a minimum of 5 students needed for the class to be held. In the unfortunate event that we do not meet this minimum, all students will be informed by the end of January and receive a full refund. Please keep this in mind when booking flights and insurance. a welcome dinner on the first evening- so we can all get to know each other! a beautiful photo book which will be sent to you after our return- as a record of your magical week!